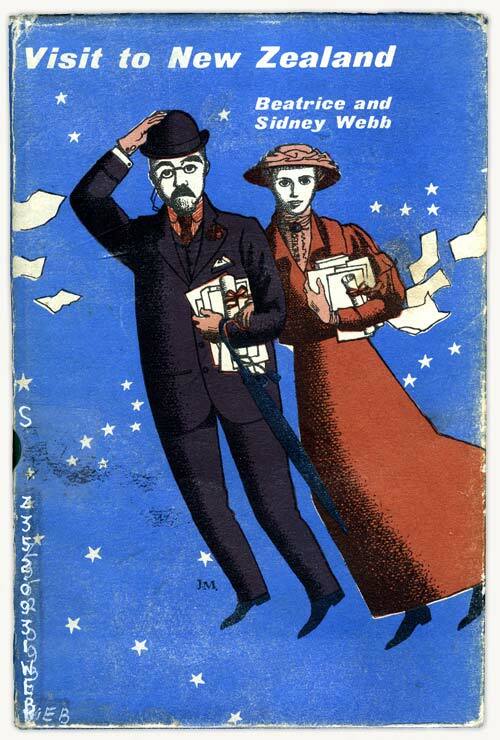 English couple Beatrice and Sidney Webb were leading members of the Fabian Society. In the mid-1890s they published books on the history of trade unionism and industrial democracy, and founded the London School of Economics and Political Science. Seeking a break, they travelled to the United States, New Zealand and Australia in 1898. While in New Zealand they both kept diaries, and this book based on the diaries was published in 1959. The Webbs were impressed by the Liberal government's reforms but found New Zealand lacking in literary culture. Reference: Beatrice Webb, Visit to New Zealand in 1898: Beatrice Webb’s diary with entries by Sidney Webb. Wellington: Price Milburn, 1959. Incredible cover that one. I haven't seen it before. I just wanted to say, in case you didn't know, that the Webb diaries are now available in full online and are searchable. I've had fun taking extracts and matching them with pictures, here is an example: http://arthurwilliam.blogspot.co.uk/2011/10/beatrice-potter-webb-on-sidney-webb.html One of many. I digress....I just wanted to point out the online diaries really in case people were interested in reading further. http://digital.library.lse.ac.uk/collections/webb#diary Search results for New Zealand are great: http://digital.library.lse.ac.uk/search?q=new+zealand The one that immediately caught my eye is her comment that: '...the New Zealanders are an easygoing race, moral but gay...' She seems to have written a lot in her diaries about NZ. Great. I'm almost tempted to do another post matching a picture and a comment on New Zealand. Thanks for the inspiration!